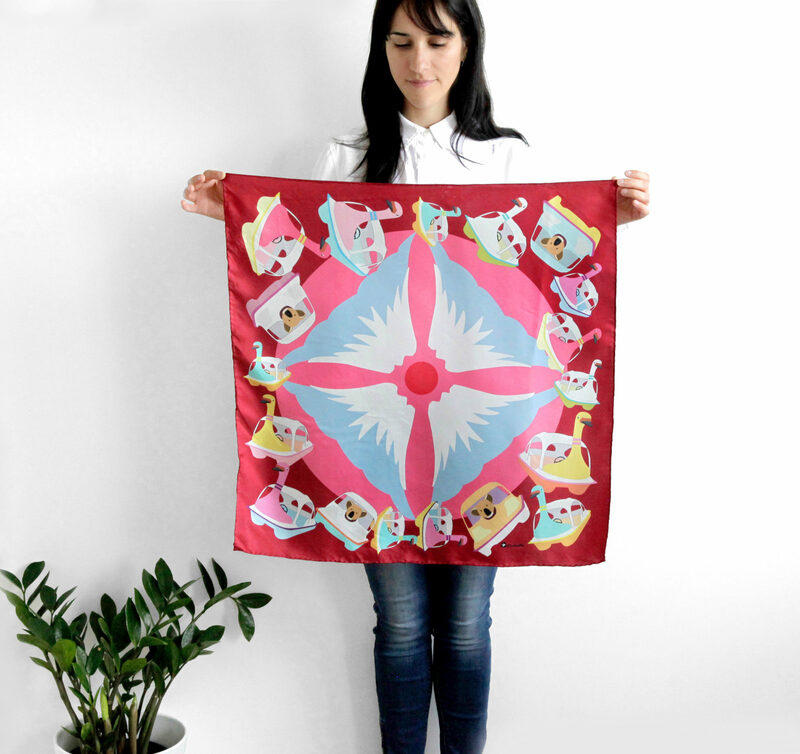 San Rafael-based textile artist Cristina Rose-Guizar creates whimsical designs that are full of humor. Photo courtesy of Rose-Guizar. Nowadays, the global is local and the universal can be deeply personal. If this sounds like an empty statement, take a look at the story of Cristina Rose-Guizar, 39, an accessories designer with an international reach and a unique coming-to-America story, working and creating right here in San Rafael. For her brand, Centinelle, Guizar illustrates colorful silk scarves, pocket squares and silk-cotton blend bandanas, decorating them with whimsical, fantastical worlds made up of hypnotizing cats, koalas in tiny pedal boats, dancing donkeys, colorful guitars, corn husks and ‘Mexican pinup’ ladies. The latter two are a nod to her home country of Mexico, which Rose-Guizar left two years ago, after meeting her future husband in San Francisco, while visiting a friend. Rose-Guizar went to Jannette Klein Fashion University in Mexico City and launched her first collection in 2010. The scarves were there from the beginning, as a simple and straightforward product. The work of Cristina Rose-Guizar. Photo courtesy of Rose-Guizar. Besides their practical appeal and the ease of their production, Rose-Guizar loves the versatility of scarves. “As a child growing up in the ’70s, I remember my mom having these gorgeous scarves in her walk-in closet, lots of them, from different places; beautiful, colorful, elegant but fun, with bold prints that some people probably will never dare to wear, but would accept in a scarf. It’s like a well-kept secret,” she says. The artist’s lifelong passion for illustration, too, contributed to the expansion of scarves. “I started to realize that I enjoy the textile design process the most,” Rose-Guizar says. After Rose-Guizar draws and adds details digitally, the prints are placed on the scarves at a manufacturing facility in China; they then make the trip around the world back to Rose-Guizar’s home studio in San Rafael. Before moving to the U.S., Rose-Guizar lived in Mexico City. Rose-Guizar and her then-future-husband lived in San Francisco upon her arrival to the country, and later moved to San Rafael. While living in San Francisco she came pretty close to her favorite Mexico City vibe; the move to Marin was an adjustment. The reason for the move? Partially, two cats, Evo and Naoko, whom Rose-Guizar and her husband adopted soon after meeting. “We lived in a studio in Pacific Heights and the cats had to sleep in the bathroom—naturally, a studio for two humans and two kittens was too small,” she says. Currently, in addition to her online store, Rose-Guizar’s accessories are sold in more than 15 stores across the U.S. and Mexico, including the San Francisco Museum of Modern Art gift shop and Mexico City’s Tamayo Museum, to name a few. She’s taken part in numerous trade shows in New York City and L.A., and has displayed her creations at Tictail Market, the brick-and-mortar Manhattan store of the online platform Tictail. She’s highly devoted to her business—it’s a full-time commitment. Cristina Rose-Guizar holds one of the scarves that she designed. Photo courtesy of Rose-Guizar. foreign culture and traveling in general.” Japan, specifically, is a big influence. “Japan is just a beautiful, photogenic surreal place. The mix with the old and new amazes me, so much energy, the incredible food,” she says. Sometimes, however, the motivation is to fix a pop-culture injustice: See the playful donkey scarf as evidence. “I just thought that the donkeys are so underestimated and deserve the same focus as magical unicorns,” she says. But our nation’s obsession with all things unicorn isn’t the only bias on Rose-Guizar’s mind. The elections, and their surprising result, shook her and led her to reconsider her position as a U.S resident. And so escapism is echoed in her newest illustrations, featuring peaceful bunnies, pink flamingoes and always, Rose-Guizar’s greatest muse, cats. But despite the somewhat intensified attitude towards immigrants these days, much of it inspired by our current president, she still feels quite at home in San Rafael, or rather comfortable in her own skin.